Victorian Motto Sampler Shoppe: Forever in My Heart, a Tribute to Sisters, new floss, new give-away, enter now! Forever in My Heart, a Tribute to Sisters, new floss, new give-away, enter now! I come from a large family of 9 children. And mixed in with the joy of being in a large family, there is also sorrow and loss. I wanted to do a tribute to sisters everywhere......and this collection is my tribute. 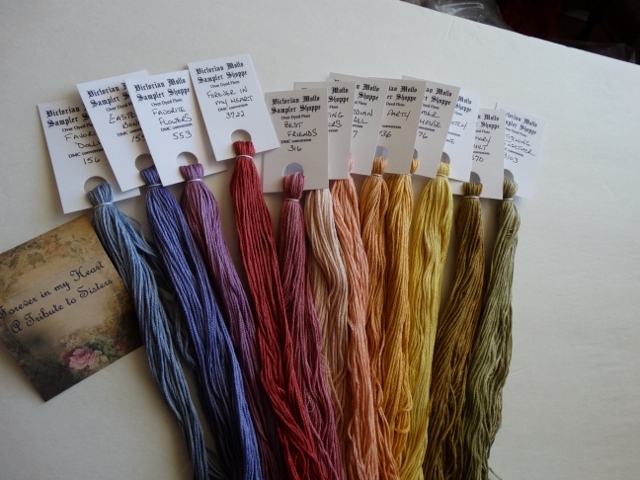 Filled with beautiful soft colors to stitch your own memories. I am sure you have noticed some of my unusual names for floss. Meaningful names. Like Best Friends, Forever in my Heart, Guardian Angel, Stitching Together, Summer Playhouse, Hopscotch, Memory Quilt, Favorite Dolly, Everlasting Flowers, Easter Bonnets, Tea Party and Favorite Flowers. A few of the memories I have of my sisters and maybe some of yours. I also want to give a set away. Rules: You must be a follower by Faithful Friends. *****Post on Facebook, your blog or stitching group and get 100 more entries. And if the entries go over 200 I will give away a second box. Drawing to be July 14. Lots of time to enter and tell your friends to enter. It's all about sharing. Thank you for stopping by. Thank you for being a Faithful Follower. And thank you for being my friends. I am a follower. I always enjoy your blog. Love the colors for Sisters. Thank YOU for being a friend Nancy. Thank you for a chance at this lovely collection. Just beautiful. Thank you my friend. I love the colors. i would love to win a set and i would share with my sister who also stitches. I'm a new Faithful Friend follower and can't wait to join the fun! I love your floss colors and winning a set would be so wonderful! What a lovely thing to create - and to be so generous as usual! Thank you for the chance! I just used your brick red floss today to do a embroidered label for a quilt. I love your floss. Thanks for a chance to win a wonderful set. Love the thoughtfulness behind this gorgeous collection. Sisters are the best, at least the one I have is! Please throw my name in the hat for a chance to win. Such beautiful colors to match the beautiful memories! Count me in and I'm posting to my Facebook now. I have two sisters who are very special. I would love to win this floss collection. A Tribute to Sisters is a wonderful name to give to this collection. That's wonderful to come from such a large family. The floss are so beautiful! I would love to win. I didn't have a sister, but wished I had. More marvelous colors! Thanks for the chance. Again, beautiful colors. I always wanted a sister so my best friends were. Thanks for the give-away. Also posting to Facebook. Lovely colors. So gracious of you to share your beautiful threads. Love my little sister. You are outdoing yourself with all of these beautiful colors. Thanks you!! 3-4 times per year my 3 sisters and I meet for about a week. We talk, do crafts, eat, and laugh, of course. We call it Sisters Without Their Misters. I'm so lucky to have them. I would absolutely love to win this collection in honor of them. Cross posted to Facebook. Thank you!!! Each set gets better and better... so thoughtful with your give aways! I have no sisters, but I love my brother! Not sure my post to Facebook went through so I am doing it again. Love these colors but I always love the colors! Love the colors and names. Such a sweet tribute to sisters. Shared on facebook. Thanks for the opportunity. I am a follower - fabulous blog! What a wonderful color range. I have always wanted a sister. Sadly I was never blessed with one. I do have 3 sisters in laws, however we aren't close, So over the years I have chosen my sisters, I will say they are the best. Absolutely love this Set! I am a follower of your blog and will post to my Facebook page. Thanks for the chance to win. Another beautiful collection, more lovely soft colors! Thank you as always. I've shared on my Facebook page. These colors are just beautiful! I can see using them for several of my girlie stitching projects. Would love a box! Such a lovely collection! Thank you for the chance to win a set. What a beautiful tribute to sisters. I don't have any, but love to watch the interaction between my 4 daughters. Thank you Nancy. Oh the stitching possibilities! Thank you for the giveaway opportunity. I have one sister who lives about 4 hours away. I wish she lived closer. Families are a blessing (even though there may be heartache at times). Love the colors. This would be in honor of my special sister-in-law. I have three sisters...no brothers. And they are all something! Thanks for the chance. I also posted on my blog. Beautiful, beautiful, beautiful! I'd love a chance to win this special box of colors. I follow by email & posted on facebook. Thanks! Beautiful colors. Just getting back into stitching after not being able to because of wrist problems. 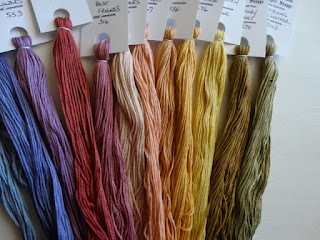 Would love to add these colors to my floss collection. what a beautiful set. If i won this one I would give it to my Twin Sister. Great job once again Nancy! Oh, I love these colors so much more than DMC. Would love to win them. I have a pattern with their names on it! More great colors! Would sure like to win some. You have the most wonderful colour families. I only have one sister. She knits and I embroider and piece quilts. Making gifts for each other works out well us! You continue to create such beautiful shades of colours. I love these colors and the sentiment that they represent! I didn't have a sister, but have two daughters and am glad they have the forever friend that a sister is! I will be posting on my FB (Augusta von Nassau). Beautiful colors for a beautiful tribute. I love my two sisters. I'm going to share this with my stitching sisters on Face Book. Thank you for this opportunity! Lovely tribute and lovely colors!! Thanks again for the opportunity to win a set. I am a follower. What a lovely way to remember your sister. My deepest sympathy and peace to you. I am one of 7 children. Six girls & one boy. Lots of sisters. Nancy I Love these colors they are beautiful I would love a chance to win them. Thank u for your generosity. 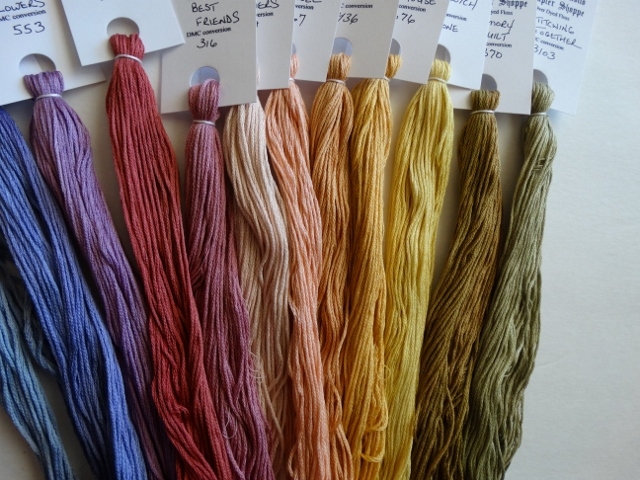 These threads look so yummy!! Thank you for such a lovely give away! You are the best! Would love these. Good luck all. Beautiful colors <3 Thank you Nancy for the chance to win these gorgeous threads :) Good luck everyone!! Your floss colors get more beautiful with each new collection. Love these! Eight children in our family; I have 6 sisters! Several of us embroider. Lovely colors! I have two sisters and they both live far away, so it's always a memorable occasion when we can meet. My sister is my best friend. We have a lot of the same interests. If I were to win I would give this as a gift to her. Thank you for being a friend Nancy. Wonderful idea and colors! I have 4 sisters--when we got together we called it Sisterfest. Our oldest sister is no longer able to travel to us so we go see her in a care home. Still have lots of giggles. Beautiful floss and beautiful memories! Thanks for sharing. Thank you for sharing such beautiful memories of family, especially sisters. thanks for this opportunity. Love this. Would love to have these beautiful colors in my work basket!! Ah, gorgeous colors! I am the youngest of 6, have two sisters older than me. I share some of those same memories - especially favorite dolly, hopscotch and tea party. The lovely floss would be a new way to connect. What beautiful colors!! I don't have a sister always wanted one. Now I count some of my friends as sisters. I think that counts. Thanks for the chance to win these wonderful flosses. These are so lovely!! I don't have a sister, but I always wanted one. I do have two sisters from another mother (or 2)! Lynn and Beth have been my besties for my whole life! We were like the Three Amigos, or the Three Muskateers, or the Three Stooges! LOL!! I would love to win a set of these beautiful flosses! Shared on FB, as always! :) Thank you Nancy for your thoughtfulness and your generosity! What beautiful colors and I love the names! LOVE the colors and the name! Another winning collection for sure! When we had to move to a different state for my husband's job, I had to leave my older sister, who I had "Craft Night" with every Friday night. It was a killer saying good-bye. We clung to each other like little girls, sobbing. In a few weeks, I get to go home to see her AND my little sister and niece (whom I haven't seen in 15 years!!). I am so thankful for my sisters. And lucky you, Nancy, for all those siblings! God bless them all and you too!! Thank you, Nancy for your beautiful talent and generosity. I appreciate being able to enter your giveaways! =) Happy Birthday to your sister. The 14th is my birthday, too! A wonderful tribute to Sisters everywhere! Beautiful Colours! I never get tired of seeing your collections! Oh I would this one! Thought I already commented on this, but I don't see my entry. I shared it a few days ago on Facebook. What gorgeous floss. I lost both of my sisters last year. I would love to win this floss and cross stitch a couple of items to remember them by. I've included you in a blog post today. I'm thinking some of your floss will end up in a needlepoint case for my sister. Just have to decide what design to use! I love those colours, they are absolutely gorgeous! I come from a large family of brothers -- always have wished I had a sister :) Beautiful floss reflecting a beautiful sentiment. Thank you for another generous giveaway, Nancy. I am the middle sister...my dad was a Red Sox fan and wanted a son but after 3 girls...my mom said three strikes and you're out! I love this collection of colors. I am a follower and love the give-always!!!! Keeping my fingers crossed!!!! I am the oldest sister and sadly we lost one this year . Love,Love these colors . Shared on my Facebook page . Thankyou . Beautiful colors! I already have a project in mind for this if I win! I just received my beautiful box of colors! Stunning! I have a twin and a younger sister, both equally as beautifu. I could not ask for better sisters, I love them so much and would be thrilled to be chosen to share with my sisters!! Wow! What a beautiful collection of threads!!! Such beautiful colors! Love them! Would love to try your thteads. Love this beautiful set of colors. I come from a family of 9 children too. I love this set and my sisters! These are beautiful and would make a nice tribute to my sis. I've linked back here again in my stitch along blog post today. I've also started using the lovely Katrina Von Tassel purple in my current needlepoint case. Yummy! These are absolutely gorgeous!Love, love, love! Lovely colors! My big sister does not stitch, but she has an endearing appreciation for my stitching and the time it takes to do it. Thanks for another chance to win some of your beautiful floss. Beautiful colors...Thank you so much for the chance to win! How endearing it is to create lovely floss in honor of your sisters. Very thoughtful you are, Nancy; thank you. These selections of threads are extra special because of the tie to your family, and, also, for anyone who has a sister. I always wanted a sister in my family. Bright beautiful colors, I would love to enter! I'm a follower and have posted on my Facebook page, thanks! Congrats, Kristen. What a lovely set of colors you have to work with now. Thank you Nancy for another generous give away! You are awesome!! !